The filmmakers at Granito's screening in Guatemala City. Photo Skylight Pictures. We stepped onto the stage of the Teatro Nacional in Guatemala City as the credits rolled after the long anticipated Guatemala premiere of Granito: How to Nail a Dictator (Spanish title: Granito de Arena). 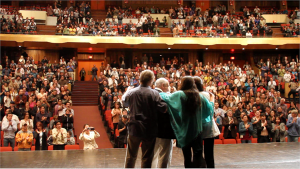 The huge hall was filled to the rafters with 2500 people who rose to give a sustained standing ovation (see the video here), which only increased in volume as the people that appear in the film joined us on stage. When Maya leader Antonio Caba Caba came up, the crowd erupted. We are so humbled and gratified by this resounding embrace of Granito by the people of Guatemala. And in an uncanny juncture with justice, the dictator inGranito, General Efraín Ríos Montt, appeared before a judge the same day as the premiere to petition for his case to be dismissed, and was denied – he will stand trial for genocide. When we announced the judge’s decision at the premiere, it elicited another burst of applause – Guatemalans have been waiting 30 years for Ríos Montt to face justice.